Bayside Marketplace in Miami is a great shopping experience for those of us who live and work in downtown Miami. 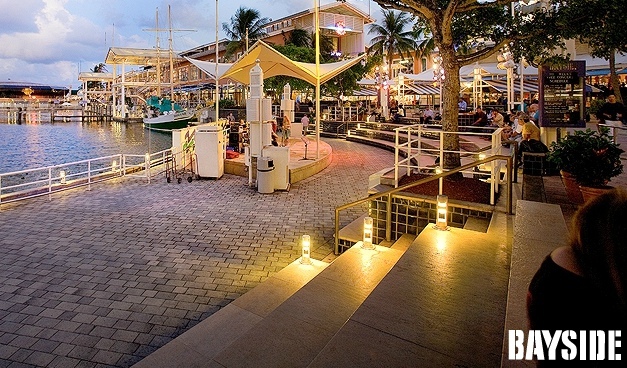 You can indulge yourself at Bayside with the best food, fun, and shopping Miami has to offer. Whether you are interested in shopping at this vibrant marketplace, exotic restaurants, daily live entertainment or national brand name stores. Bayside Marketplace features a unique collection of internationally recognized stores including Guess, VBath & Body Works, GNC, Perfumania, Brookstone, Express, Gap and Baby Gap, Foot Locker, Game Stop, Lady Foot Locker, Sunglass Hut, The Disney Store, and Victoria’s Secret. There’s a lot to do at Bayside Marketplace! Dine with friends at exciting restaurants such as Bubba Gump Shrimp Co., Chili’s, Hard Rock Cafe, World’s #1 Hooters for the past 12 years! Bayside Marketplace is conveniently located on Biscayne Boulevard just south of American Airlines Arena and features some fantastic stores! Bayside’s wealth of activity offers something for everyone.